This Saturday, November 23, 2013, will mark the one-year anniversary of the death of father and teacher Tom Samson. On July 22, 2013, the Toronto Star published a story outlining how the Samson family hired prominent criminal lawyer Edward Sapiano to set the record straight as to how Tom was killed by a careless motorist. They knew that Tom was a safe cyclist and they were shocked when the police told them they would not be charging the driver with any traffic infractions. Sapiano was successful insofar that the police have changed their report: But Sapiano went further to say he believed that the initial conclusions – which are still a matter of public record -- were the result of a shoddy investigation, something he suggested is indicative of a systemic failure by police to conduct thorough investigations when cyclists or pedestrians are killed after being struck by cars on city streets. From the Star article: “A drug-dealing criminal who is shot and killed during a deal gone bad gets a higher degree of investigative services from the TPS,” Sapiano wrote in a letter to the Toronto Police Service. On behalf of the Samson family, Sapiano is calling on police and the Crown to reopen the case, now that they’re acknowledging Samson was stationary, waiting to turn left, as he was lawfully obliged to be, when he was hit from behind. Sapiano also obtained a copy of Miguel Oliveira’s [the driver who killed Tom] driving record. Between July 2010 and last December, Oliveira had eight driving infractions, including failing to come to a stop, disobeying a police signal, violating novice driving conditions and speeding. Safe cycling advocate, Eleanor McMahon, whose husband Greg was killed while riding his bicycle, worked for years to bring something now known as “Greg’s law” into legislation, which gives the police the power to immediately impound the vehicle of someone found driving while under suspension. Yet, when the driver that killed Tom finally turned himself in, his blood was not tested and he was not charged with anything other than failing to remain at the scene. The death of cyclist Darcy Allan Sheppard in Yorkville in Toronto was also fraught with investigative discrepancies – due, in large part, to the high-profile of the driver of the car: he was a former attorney general. Darcy Allan’s father, Al senior, is relieved (especially for the sake of his grandchildren) that the record has finally been set straight with a book about the horrific incident and Darcy Allan Sheppard’s life, called Lost Boy. Read our review of the book here. In 2012, Toronto, Canada’s largest city, with a population of around 3 million people, had triple the amount of traffic-related injuries compared to Montreal, despite a population difference of only 700,000 people. This year alone has seen 51 traffic-related deaths in Toronto. This number is up from the 32 fatalities in 2012 and accounts for the 16 motorists and passengers, 3 cyclists and 32 pedestrians killed in traffic collisions in the GTA. These numbers are the highest they have been in the last five years. It’s clear that the traffic infrastructure and legislation we currently have in Toronto is not enough to keep people safe. Besides better infrastructure for cyclists, which we call for regularly here at dandyhorsemagazine.com, we also need to look at the way the police investigate traffic collisions where cyclists have been injured or killed. Many articles in popular international publications like the New York Times, The Times (UK), The Economist and the L.A. Times have recently called for stronger and clearer laws around traffic collisions for vulnerable road users. Car crashes are the leading cause of death of people aged 5-34 in the USA. Between 2006 and 2010, there were 129 cycling fatalities in Ontario. These deaths, along with the deaths of 95 pedestrians in Ontario in 2010 prompted Ontario’s Chief Coroner to investigate traffic safety. In the summer of 2012, the coroner summarized the findings of his office regarding cycling fatalities as being preventable through infrastructure, education, legislation and enforcement. The locations of the deaths of cyclists in Toronto’s streets have been documented and made available to the public on a memorial map, developed by photographer and cyclist, Martin Reis (seen below) -- many of the collisions involve large trucks. Large motorized vehicles are particularly dangerous for pedestrians and cyclists: and the coroner also found that too many pedestrian and cycling fatalities were the result of collisions with heavy trucks. The City of Toronto’s Toronto Bicycle/Motor-Vehicle Collision Study (2003) found that large trucks were overrepresented in both cycling and pedestrian fatalities. Toronto recently mourned the death of Carla Warrilow who was struck by a truck trailer on Spadina near Dundas. Jenna Morrison was killed by a right-turning truck on Sterling at Dundas in Toronto where the city – two years later – has just now finally installed a set of traffic lights. In both coroners’ reports to date investigating cyclist and pedestrian fatalities, it is recommended that side guards for trucks be made mandatory. These side guards, already mandatory in other jurisdictions, including China and the UK, would prevent more vulnerable road users from being pulled underneath if they were to be hit by a truck. There have been public petitions in Ontario and Quebec to make side guards mandatory. MP Olivia Chow originally brought forth a private members bill to mandate truck side guards and has been instrumental in pushing for side guard legislation. A group called SafeTrucks is now supporting the most recent bill called the cyclists-pedestrian protection act: Sign the petition and find out more about how you can help here. Clearly, biking and walking are not dangerous activities in themselves – cars and trucks are what bring danger to our streets. Distracted driving needs stiffer penalties. As a society we must focus on solutions that will reduce the number of cycling and pedestrian fatalities. In the EU, many jurisdictions already legislate that drivers should have presumed liability in cycling accidents, and some jurisdictions in the USA are now moving towards laws to help protect more vulnerable road users. We reiterate the need for better legislation and more effective infrastructure for cyclists. In Canada, the evidence demonstrating how dedicated bike-friendly infrastructure increases the safety of the cyclist has already been established. In Montreal, some of these recommendations are already in place, and the results are reflected in that they have fewer documented injuries and deaths. 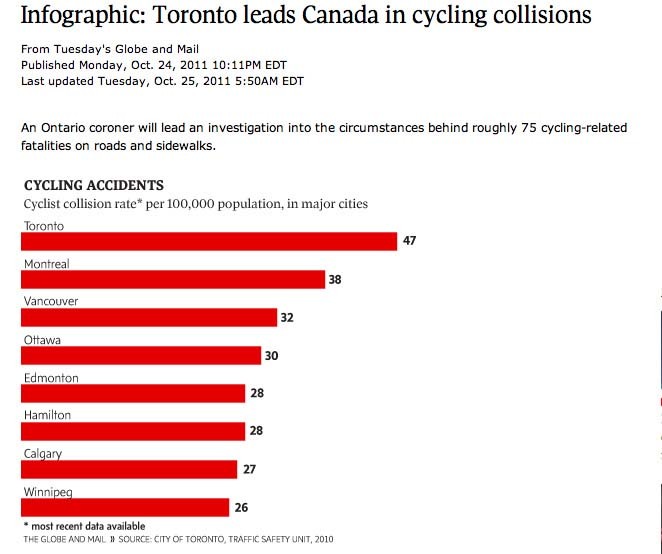 A couple years ago the Globe and Mail printed an infographic showing how Toronto leads Canada in cycling deaths. And the ensuing coroner’s report on cyclist deaths in Ontario then said that 100% of these deaths were preventable. What has been done since these reports to improve safety? Not much it would seem. Today is World Day of Remembrance for Road Traffic Victims, endorsed by the United Nations. The group, Advocacy for the Respect of Cyclists (ARC) in Toronto has organized memorial rides for nearly every cyclist killed in traffic since 1996. Here is the memorial map of the locations of cyclist’s deaths in Toronto that photographer and cyclist Martin Reis maintains. We remember fallen cyclists in Toronto. Struck by a truck on Spadina and Dundas. Succumbed to injuries several days later. Killed by a truck while riding along Lakeshore. Killed in multi-vehicle collision caused by an impaired driver. Samson, a schoolteacher, was killed in a hit-and-run collision during the early morning. Rankin was a bike courier riding down University when he was struck and killed by a cab driver. The police initially threw his belongings – evidence for the investigation – in the garbage. Struck and killed by a truck on Sterling Road near Dundas. Struck by a car at the intersection of Greenwood and Plains Road. Struck and killed by streetcar at Spadina and Lakeshore. Struck and killed by two cars while travelling south on Colborne Lodge Drive and attempting to cross Lakeshore. Bike courier killed at Bloor and Bay. Criminal charges laid against the driver were dropped in May 2010. Struck by a streetcar on Spadina and Nassau. Succumbed to his injuries two days later. Struck and killed by an SUV at the intersection of Thretheway and Tepper. Shot and killed while riding bike on Sultan Pool Drive. Struck and killed on Eglinton and Braemar. Aged 57. Killed by a truck thief. Aged 7. Killed while riding her bike along a crosswalk on Bay Mills and Birchmount. Struck and killed by dump truck at Bayview and Fifeshire. Struck and killed by cement truck. Struck and killed by a truck on Keele and Finch. University of Toronto professor struck and killed by a truck on Avenue and Cortleigh. Social worker struck by truck at Leslie and Eastern. Comic book artist struck and killed by truck at Gladstone and Queen. Struck and killed by garbage truck at Horner and Kipling. Aged 11. Photographer. Killed in a collision with a heavy truck. Bike courier killed on his way home from work by a drunk driver. Struck by car at Martin Grove and Finch. Succumbed to injuries the next day. Old Kingston Road and Orchard Park. Struck by an SUV at Bloor and Islington. Struck at Kipling and New Toronto. Died the next day. Struck by a vehicle while riding his bike with his wife. Succumbed later to his injuries. Struck and killed by a tanker truck at Spadina and Clarence Square. Aged 7. Struck by car at Martin Grove and Westway. Succumbed to injuries the next day. Struck by minivan at Oak Park and Lumsden. Killed at Queen and Beech. Aged 25. Andrews was struck and killed while riding through intersection at Dufferin and Bloor. Struck by car at Allen and Eglinton. Aged 14. Struck and killed by school bus after being doored by a car. Succumbed to injuries four days after her collision with a van on Queensway and Roncesville. Struck by car on Keele and Wilson. Succumbed to injuries the next day. Killed at Mt. Pleasant and Roxborough intersection. Killed by truck on Bathurst and Queen. Killed by car a King and George. Singer/Songwriter struck and killed by a truck at Bloor and Church intersection. Struck and killed by garbage truck at Sackville and Gerrard East. Driver of truck was initially charged with dangerous driving, but was later acquitted. Aged 16 years, died at Ellesmere and Birkdale. 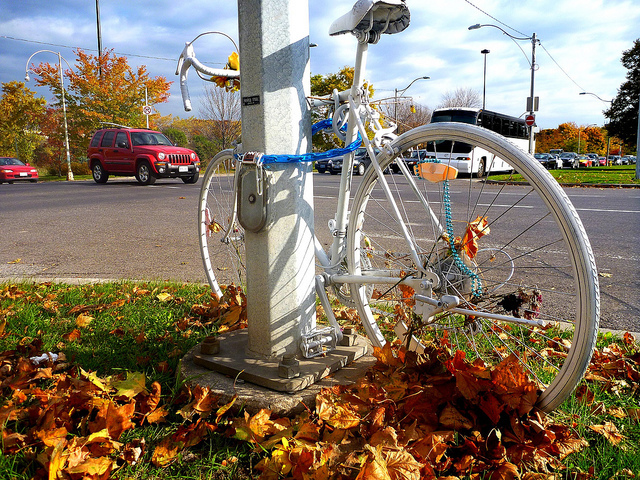 We gratefully acknowledge the work of Martin Reis on keeping this important public record and for photographing ghost bike memorials, collision sites and other important bike events in Toronto. These are important documents in keeping the public record straight. Lost Boy: Book review by Derek Chadbourne with comment from Al Sheppard Sr. There needs to be more pressure on the shytstem… or have more tourists pegged on Bixis!! Hi there, thank you for this and for continuing to educate and inform us about the social and political realities behind cycling accidents and fatalities. I’m a year-round cyclist and sometimes the risks really scare me. More than anything, I think I worry for my family and friends who also ride. Why aren’t we being more protected through simple measures like the truck side rail guard? I’d also like to request that you remove this offensive phrase: ““A drug-dealing criminal who is shot and killed during a deal gone bad gets a higher degree of investigative services from the TPS.” This phrase speaks to a really repugnant callousness toward human life. Yes, drug dealers get murdered. And when they do, it is just as heart-breaking and just as much a loss as when any other human life is lost–and deserves the same level of concern, justice, healing and accountability. This phrase alludes to classist and racially-loaded stereotypes about who is a drug dealer and suggests that their lives are of lesser value and that their deaths deserve less attention. Please remove it and address the white middle class biases in your organization that would have led to your publishing this. thank you. I’d love to know the source of car crashes being the leading cause of death for people 5-34 in the US so I can use it in my advocacy. Thanks!